Trekking poles are not simply the outdoor gear store’s way to get you to spend more money in their store. Trekking poles actually serve a purpose, and can help make your next hiking adventure much more enjoyable. I know there are some hikers, experienced or not, who never have nor never will own a pair of trekking poles. Trekking poles, like everything else in life, aren’t for everyone. But, a good pair of trekking poles can be your best friend out on the trail. One advantage of trekking poles is weight distribution. Trekking poles help to disburse the weight you are carrying on your back by transferring some of the weight to your arms and the poles. Trekking poles can reduce the weight of your pack up to 20 to 30% as you move along the trail. Thus, the weight of a 50 pound pack can be reduced by 10-15 pounds using trekking poles. Distribution of the pack’s weight across back, legs and arms means less stress and strain on muscles and joints, particularly the knees. The trekking poles work to absorb some of the load, especially as you hike downhill. Balance is a must out on the trail. An overturned ankle can ruin your outing and perhaps take you out for an entire season. Trekking poles are a tremendous asset in the balance department. Just stop and consider – Fording a creek? Trekking poles will save you from getting soaked when you lose your footing on those slippery rocks. Hiking downhill? Trekking poles will help anchor and keep you upright as you make your way down the hill. Once you load up your pack, your center of gravity shifts backwards. The additional weight of the pack can cause you to quickly lose your balance, especially if your load shifts. When using trekking poles, you shift that center of gravity forward. This gives you a better balanced and more comfortable hiking position. Most everyone who uses trekking poles will agree that the poles help you to maintain a steady pace while hiking. You quickly develop a rhythm combining breathing with arm and leg movements. For the most part, this means you will be hiking longer and farther than ever before. An added fitness benefit while hiking with trekking poles is enhanced cardiovascular conditioning. 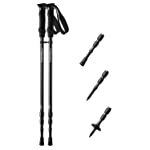 The trekking poles engage the upper body as well as your legs and back during the hike. This results in a full body workout. How do you determine which trekking poles are right for you? Let’s face it, if hiking and backpacking is a new adventure for you, then you probably don’t want to buy the most expensive set of trekking poles you can find. There are a myriad of different trekking poles out there and it is important that you consider all of the different features when choosing a pole that is right for you. The majority of standard trekking poles are made from aluminum or an aluminum alloy. These poles are less expensive and no frills, but offer reliable performance. As the name implies, the anti-shock poles incorporate a mechanism that absorbs the shock as the pole is planted. The basic concept behind the anti-shock system is to provide a means of absorbing the downward force of the pole striking the ground. Usually located in the shaft or in the handle, anti-shock is a great feature to have if you have shoulder and/or elbow problems or if you are looking for that extra comfort so that you have the ability to hike until you are well past your prime. Once you have experienced the benefits of an anti-shock trekking pole, you won’t go back. 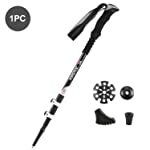 The anti-shock trekking pole is a good choice for those with bad or weak knees, hips or ankles. Usually more expensive than a standard trekking pole, the anti-shock feature can be turned off on most poles. Made mostly from carbon or other lightweight material such as Komperdell’s Titanal HF, ultra-light trekking poles are perfect for the hiker or backpacker looking to maximize weight reduction. Because they are lighter than standard poles, hiking with a set of ultra-light trekking poles means less fatigue at the end of the day. 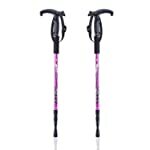 There are trekking poles made specifically for women. These poles come equipped with compact grips and are usually shorter in length. Trekking poles for women are lighter in weight making them easier to swing. Some manufacturers also offer kids trekking poles. Most trekking poles these days are made from high-grade aluminum that can withstand tremendous amounts of abuse. In addition, manufacturers are using titanium and other composite materials. The advantage of these high tech materials is primarily weight and durability. The type of material can greatly affect the cost of the poles. Adjustability is the name of the game these days. How small your poles get depend on how many sections of poles make up the shaft. The more sections, the smaller your poles can break down. Three section poles break down the most for easy and safe storage. Two section poles are sturdier and have fewer parts that can potentially break. Fixed length poles have the greatest strength but are a pain to tote around when they are not in use. When it comes to tip material, durability is a big concern. Carbide and Tungsten are by far the most durable tips on the market. They will stay sharper longer and you will have to replace the tips less often than with other material. Steel tips are the most affordable but wear out the fastest. Most poles allow for the use of a rubber tip to be added or removed when traveling through sensitive areas or for when you want your poles to have “sticky” ends. Another point to consider is when purchasing is whether or not the tip is replaceable. Some poles feature a replaceable tip so that if the pole gets lodged or caught, it can break away. Replacing the tip is much cheaper that replacing the entire pole. Foam: Usually made of closed cell foam; Conforms well to your hands but does not have the memory of cork; insulates well; will break down faster than plastic, rubber, and cork. Ergonomics is playing a larger part in grip design than ever before. Many manufacturers believe that using a grip that adjusts the pole as much as 15 degrees help alleviate fatigue and provides a more comfortable swing weight. Komperdell’s Duo Lock locking mechanism – The basis to this locking mechanism from Komperdell is a wide area of pressure against the pole walls. This ensures the pole locks and is held secure at the desired length. LEKI’s Super Lock System (SLS) – This dependable system from LEKI uses an expander and screw combination that securely locks the pole in place once it has been adjusted. Black Diamond’s FlickLock system – Probably one of the easiest locking mechanisms to use, the Black Diamond FlickLock system features a lever-based, clamp-like mechanism to lock the pole after adjusting. An avalanche probe is an essential winter back country tool coveted by winter outdoor enthusiasts. What many pole manufacturers provide is a means of extending the pole as to accommodate the search and rescue of victims buried in a avalanche. The benefit of having your poles convert into a probe is weight and storage. If the probe is in the poles you don’t have to carry the extra set of poles. Once you purchase a pair of trekking poles, it is important to understand how to adjust the poles for your use. It is equally important to use your trekking poles correctly for maximum benefit. Proper pole length is important and you may find that you need to adjust the length for extended uphill or downhill hiking. Lengthening the pole for downhill will allow you to stay in an upright position as you descend. Shortening the pole on uphill treks will give you better leverage as you plant the pole. Walk normally, planting the trekking pole with the opposite arm as you stride forward. Don’t try to over-reach as this method will tire you quickly. When planting the trekking pole, angle it so the grip is ahead of the tip. This trekking pole technique will allow you to propel yourself forward as you push off. It won’t take long for you to get into a natural rhythm when using your poles. You may find that planting the pole on the same side as your lead foot gives you better balance and more leverage on a difficult uphill climb. On steep downhill treks maintain the opposite pole versus foot method. However, plant your pole a bit further out than normal. This will give you added stability as you maneuver down the hill. Baskets are easy to change and it’s always a good idea to keep a spare pair on hand. 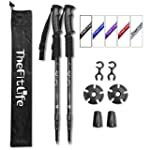 The majority of trekking pole tips today are flex tips. Flex tips are multi-purpose and can be used for a variety of surfaces. If you are planning to use your trekking poles indoors or on improved surfaces, plan on purchasing trekking pole tip protectors. These protectors are rubber tips which fit over the end of your poles. Trekking pole baskets and trekking pole tips are not the only trekking pole parts that can be replaced. Some trekking pole manufacturers even offer trekking pole replacement parts such as shafts.